Every once in a while I like to get back to old school marketing and talk about how small business marketing naming concepts work in the real world! People will ONLY buy what they can understand and they do not have your knowledge of the back story of your products. This is the WORST name for a product I have ever seen (the name of the business is kept secret for obvious reasons)! They are a butcher and sell meat products. 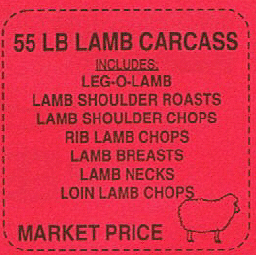 Naming a product “55 Pound Lamb Carcass” may be factual BUT I wonder how much it improves sales…:) I especially like the fact that they talk about dead sheep and then put a picture of the little wooly lamb next to it! The other end of the bad naming concept spectrum is someone who has a great concept but does not name their product or even set the parameters for what it entails. There is a woman in my networking group who has gotten SO much better. Before she talked about how she sold “happiness” and “feeling good”. That IS focusing on the benefits of her products BUT we had no idea what-so-ever what she was actually selling! Now she is actually saying what her product is and I have to think that she will sell more of them!